The night before I left, however, I found myself in a quandary about which bag to pack it all in. I own several bags that work as a carry-on, but unfortunately, I’ve always felt they were all slightly lacking in one way or another. 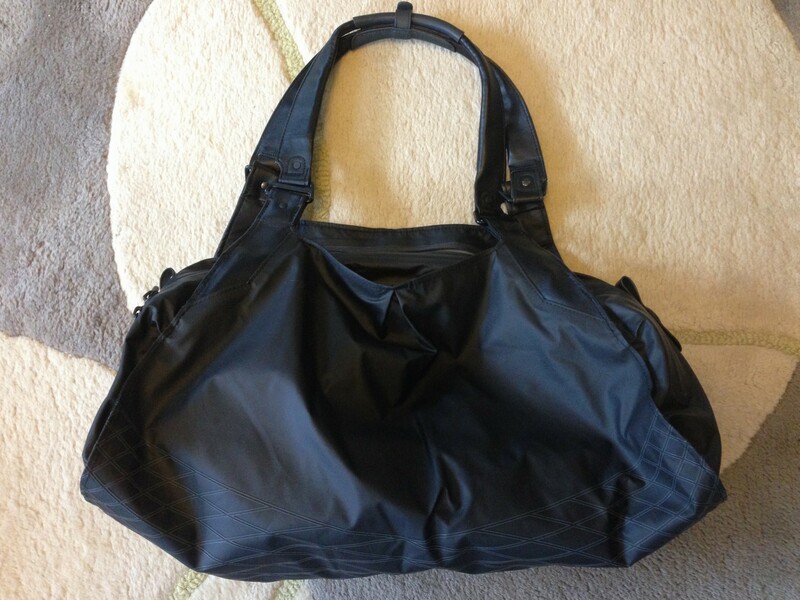 For instance, I have this gym/overnight bag: It’s comfortable to carry, and even has a great waterproof pocket for a wet towel or swimsuit. 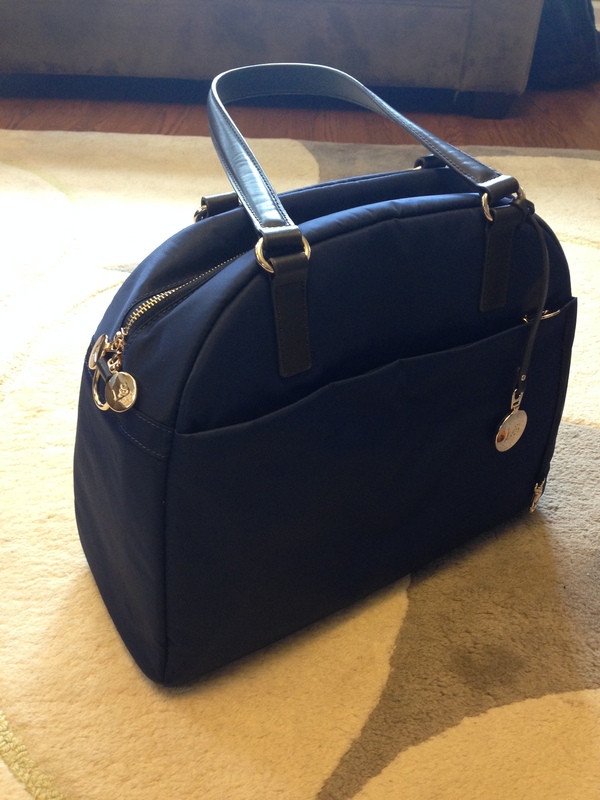 But the compartments are kind of long and narrow, and won’t accommodate a laptop. It also doesn’t fit well under an airplane seat, which means either unpacking a bunch of stuff before you sit down and then repacking it when you land, or making sure you sit on the aisle so you can keep getting in and out of it. Blech. 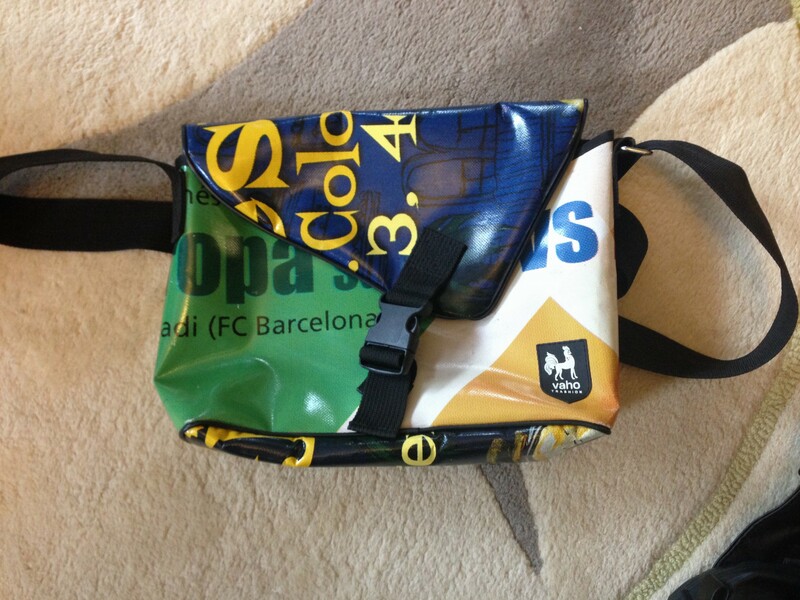 I also have this computer bag that I bought in Barcelona a few years back: It’s made out of those vinyl banners that you see on lampposts to advertise special events. I love the company, Vaho Trashion, that makes the bags, and appreciate that they use reclaimed materials. 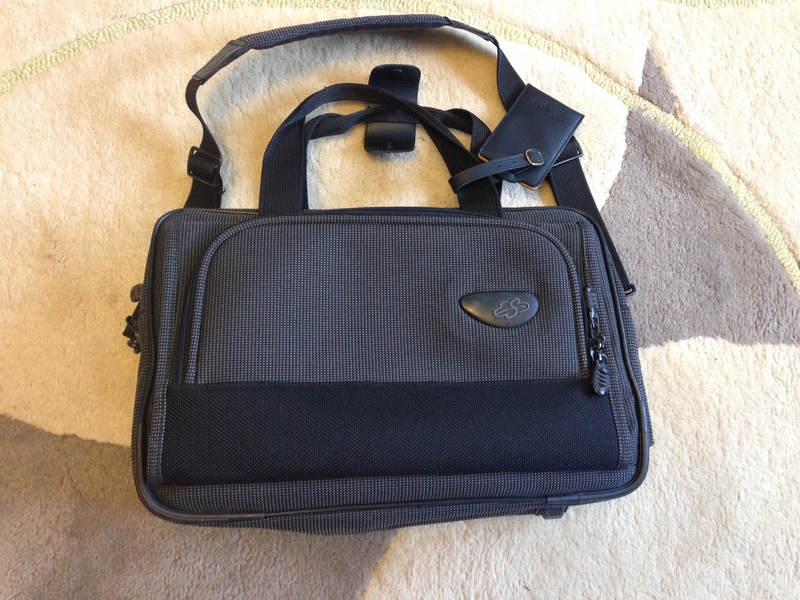 However, the bag isn’t padded, so it requires me to also use a protective case on my laptop, and while it’s fine when using it around town, I did worry about it getting knocked around too much during extensive overseas travel. It also doesn’t hold much more than a computer and a few files, so there was no way I was going to get all my other crap in there. It’s easy to carry, and fits well under an airplane seat, but after multiple attempts to pack all my stuff in it, I had to admit it was just too small (especially with that extra pair of shoes). In the end, it won because it was easy to carry, and big enough to hold all my stuff. I also figured because it was so unstructured, I’d be able to cram it under the seat in front of me. It had a little extra room in case I were to buy anything on my trip – but not enough that I’d be tempted to splurge. Carrying this bag made me miserable. Because it has absolutely no padding or structure of any kind, I was super neurotic about my laptop getting damaged. The lack of structure also meant that all my stuff clumped up into a pile inside, so finding anything in it was really difficult, and then trying to shove it back under the seat in front of me was almost impossible. The structure issue also meant that the weight inside the bag was frequently unbalanced, so it felt like I was schlepping around a large bag of rocks, and my items would shift into odd angles and poke out the sides, so at one point I found myself running through the Amsterdam airport to make a connecting flight while being repeatedly stabbed in the ribs by the sharp corner of a book. I tried balancing it on the handle of my roller bag while walking along the cobblestoned streets in France, and within seconds it would slide off with a thunk and topple my bag over. In short, it sucked. When I got home, I decided to casually start perusing options for a good replacement carry-on. I didn’t have another trip planned, so I wasn’t in a hurry, but to my surprise and delight, I almost immediately stumbled across this incredibly great company called Lo & Sons. What makes Lo & Sons so wonderful? Their bags are smart, sleek, lightweight, and beautifully designed. They hold a TON of stuff. They look classy and stylish. They are designed to conveniently, and firmly, attach to your roller bag. Most of them are made to fit under an airplane seat. They come in a lot of different designs and color options, and all of them are lovely. I could go on and on. (And no, Lo & Sons did not sponsor this post, I am just truly a huge fan now). They also did one of the smartest things on their website that I’ve ever seen a bag manufacturer do: They made a video for each bag, showing someone packing it, and exactly what they were able to fit into it. 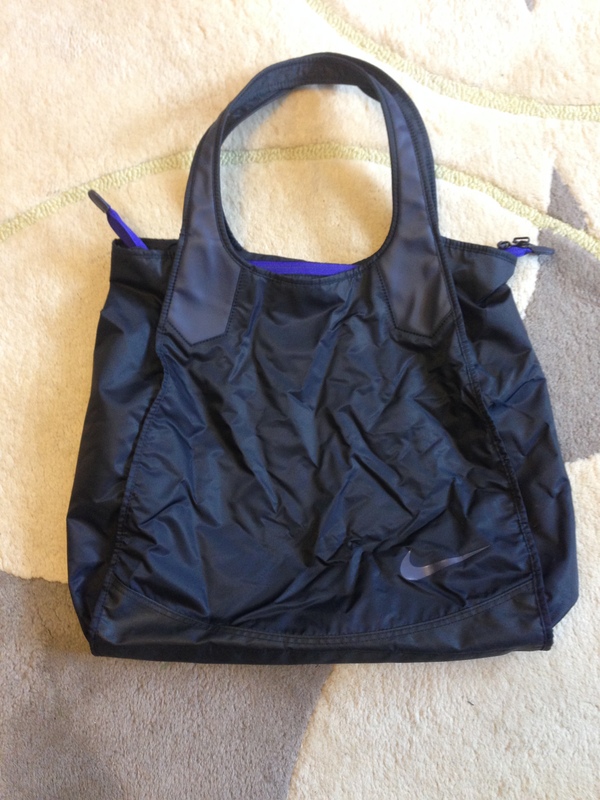 So even though I was purchasing the bag online, I was confident it would work for me – without the video, I’m not sure I would have ventured to try it. Their bags are not dirt cheap, but after owning one, I can tell you I have absolutely no regrets (I also got mine on sale, and I had Christmas gift money to spend, so no debt was incurred). This bag is PERFECT for me. I took it with me on my recent trip to Hawaii, and I carried all of the same things I took to France (including an extra bikini and some fashion mags for poolside reading), and it worked like a dream. I especially appreciated how thoughtfully designed it was in terms of the interior and exterior pockets, and how easy it was to access my stuff during the flight. I got the OMG in navy, and I couldn’t be happier. Click on over to their site and watch the videos for each bag – they do not misrepresent. I got rid of three of the other not-so-great carry-on in my collection (believe it or not, I kept the bag I took to France, because it’s a good around-town tote. But I won’t be taking it on any more flights, ever). I have a feeling I won’t miss any of them a bit. If I didn’t already have my Briggs & Riley carryon, which matches my Briggs & Riley rollaboard (and attaches to it as well), I’d be on this bag like a hog on a june bug. 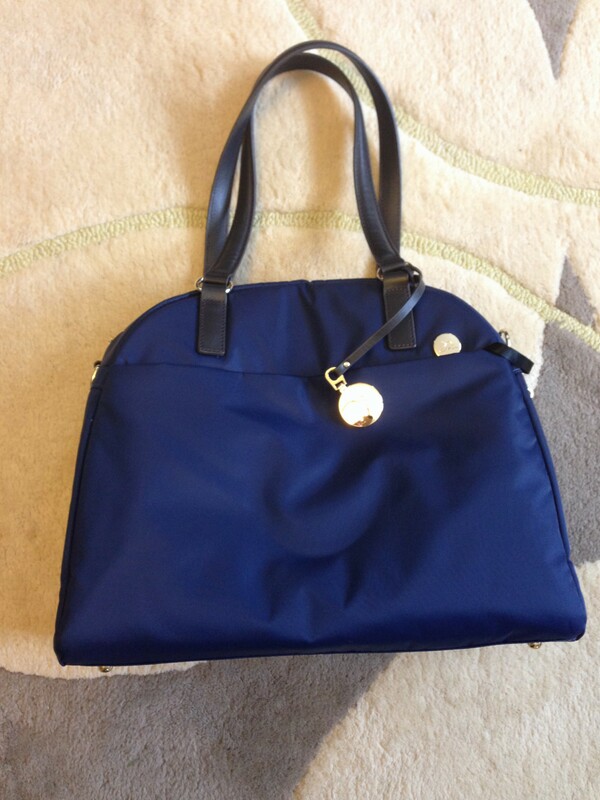 What a beautiful bag, and so handy! Also, the price is good. This bag will last you for years. So classy looking too. Sandra, I have a Briggs and Riley roller bag too, and I LOVE that as well – I brought that as my checked bag, with the Lo and Sons as my carry on. When it comes to luggage, I am always willing to invest in a quality piece – the good stuff lasts forever and is well worth it.